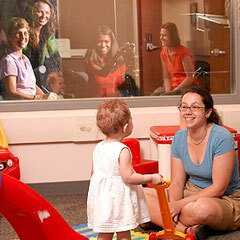 Developmental psychology is a subfield within psychology which focuses on the study of age-based behavioral changes. Historically, the term has been used specifically to refer to the behavioral development of children, but developmental psychologists actually study people of all ages, looking at behavior from the womb until death. Researchers in this field can apply their skills to the treatment of children with psychological disorders, the analysis of psychological issues which pertain to criminal cases, education, elder care, and a number of other situations. Researchers in this field primarily gather evidence through observation, with each study adding to the overall body of material in developmental psychology. Experimentation under controlled circumstances may be used by some researchers, but most focus on watching humans in natural environments and learning about the ways in which development can be influenced or altered. Since many experiments involving the manipulation of environment could involve unethical methods such as subjecting children to sensory deprivation or malnourishing infants to determine the role of diet in infant development, observation is often the only way to gather data. Developmental psychologists are interested in the emotional, intellectual, and moral development of people throughout their lifespan, looking at everything from the age infants first respond to specific stimuli to the behavioral changes which occur in the elderly. Developmental psychology is also concerned with physical and social development, such as the age at which boys and girls start differentiating between each other, or the dynamics of middle aged adults. They also study humans in the womb, especially in the later phases of pregnancy when the fetus appears to be engaging in conscious actions. The study of developmental psychology is critical to understanding how humans mature, and to identifying issues with human maturation. Developmental psychologists, for example, can set basic milestones which can be used to determine whether or not a child is developing normally. Lagging behind normal development or failing to meet development targets by a specific age can be an early sign that a child is experiencing problems which need to be addressed. Research in developmental psychology can also be used to explore the developmental differences between different populations, and the reasons why some groups seem to develop more quickly than others. This research can be valuable when people are deciding how to allocate funding and which social and educational issues need the most attention, as developmental psychology has illustrated that people need sound developmental building blocks to grow into healthy, well-adjusted adults.